Normal price R 6,900- incl. Special price R 6,400- incl. Supersize me… We hear you! Raw has, over the last year, had numerous requests from clients to create a full lenght (8 seater) version of our best selling Tressel™ table. By further developing the already existing Tressel™ Boardroom table we are proud to present this 8 seater dining table to the public. 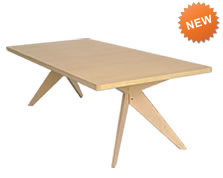 Enhancements from the standard Tressel™ include a thicker top, thicker legs and on the whole the unit is easier to assemble. 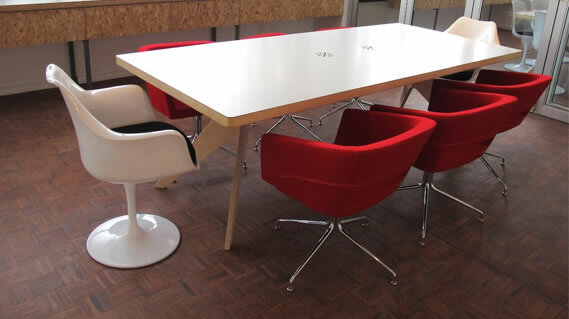 As a welcome consequence of the size of the top, 2000mm x 1100mm, we have minimized wastage on the raw material and can now offer these at the very competitive price of R 6,900- for the natural and R 7,400- for the white (smooth laminate) finish. Tressel™ XL …… the perfect combination between value and elegance.